Neck injuries can be tricky, demanding the expertise of a trained sports medicine doctor who also practices regular pain management techniques. Neck injury treatment can be as simple as modifying the way you work and play or as complex as requiring delicate surgery. Seek help from your Midtown Manhattan doctor for a correct diagnosis and the proper treatment for your neck injury to prevent further complications. Come to our sports injury clinic and meet the top rated pain doctor Febin Melepura M.D. to get the pain relief you need in the safe, reassuring hands of the best sports pain management specialists in NYC. Your neck works hard to manage the dual duties of holding the weight of your ten-pound skull and being flexible enough to move your head as needed. Because of the rather precarious position of your head atop your seven cervical vertebrae, your neck is quite susceptible to injury or damage, especially as you age. Even if you take care of your neck properly, neck injuries can still happen. Every moving part of your neck has to work together. The vertebral bones, discs, ligaments, tendons and muscles are all potential areas of concern for neck pain. Understanding the anatomy of your neck and the ways it can be harmed help you discuss treatment options with your Midtown Manhattan sports medicine and pain management doctor when neck pain occurs. Because your spinal cord runs through the center of your spine, damage to the vertebrae can occur that impinge or compress the nerves between the bones. This damage can have long-lasting consequences. It can even cause paralysis. If someone you’re with suffers a suspected neck or spinal injury, call 911 immediately. Don’t move the person if possible. Don’t reposition their head or try to remove a helmet. Keep the person as still as possible unless they aren’t breathing. Perform CPR by moving the jaw rather than tilting the head. Your pain specialist in New York City begins your assessment by taking a medical history that includes any injury or activity that might have led to your neck pain. He conducts a physical exam to check for numbness or tenderness and then orders imaging tests — such as x-rays, CT scan, MRI, or EMG — if needed. If your Manhattan pain specialist suspects disease may be contributing to your neck pain, he orders blood tests. This determines what kind of treatment protocol he’ll recommend. An accurate diagnosis of the cause of your neck pain has to precede your neck injury treatment. While surgery to remove bone spurs may be required, it’s always the last resort due to risks of infection and the delicacy of your neck. Recovery time can be a few days for a minor strain to a few months if surgery is performed. Neck pain from injuries are uncomfortable and have the potential to be chronic if not properly treated. Work closely with your Midtown Manhattan sports medicine and pain specialist for the best road back to a pain-free lifestyle. 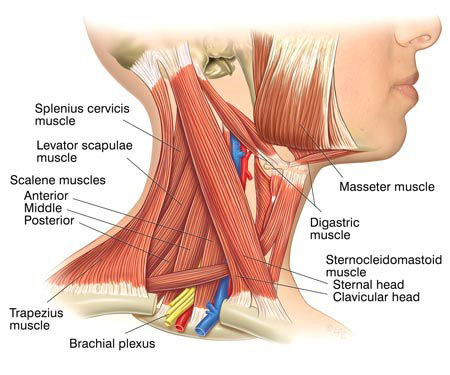 Do you have any questions about the neck injury treatment we offer in NYC? 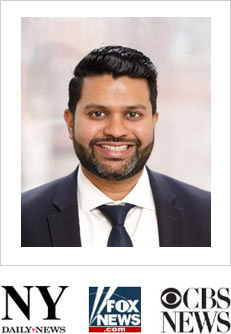 Would you like to schedule an appointment with the best rated neck pain management doctor Febin Melepura MD of NYC sports pain management clinic? Please contact our office for consultation with the pain relief specialist in Midtown Manhattan.